I heard about Basil Alcove just a few weeks ago. A fantastically talented art director I’ve been working with on a project mentioned it to me, telling me that it was a great place for good, cheap pastas. I have to agree. This super-tiny little cafe, located on the outside of Fortune Centre on Middle Road, serves good simple and very reasonably priced fare. Amusingly, when I asked Xander, the 23 year old owner and chef, what the concept of Basil Alcove was, he told me, “fine food in a not so fine place”. Xander offers a daily set lunch priced usually around S$6-S$7 and has an a la carte menu in the evenings. The lunch here, if you work or live in the neighborhood, is definitely worth the trip. You get a homemade soup, your chouce of daily specials and a drink. The a la carte menu is pretty good too. Style-mavens and fashionistas in Singapore have been spending their Saturdays of late checking out the many cool boutiques that have sprung up on Haji Lane, parallel and in between Arab Street and Bali Lane. Foodies now also have a reason to head down to this newly-chic street. Pluck, a very cute self-styled “style emporium”, has just opened an ice cream parlour. After doing some serious shopping at Salad and White Room, this seems to me the perfect place to rest for a while. Retail therapy and super-cool sundaes? Count me in! 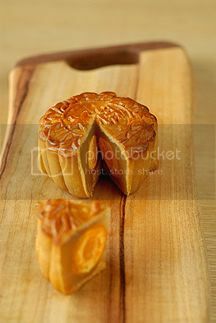 I’ve never been much of a mooncake fan. That said, I do appreciate a really well-made one. The best I’ve tasted so far this year comes from Chef Yong Bing Ngen of the Majestic restaurant, in the New Majestic Hotel. I had the pleasure of tasting his traditional mooncake, with lotus seed paste and salted duck egg’s yolk. What really impressed me was how thin and delicate the pastry crust was, how smooth the lotus seed paste was, and how fresh the egg yolk tasted. It was quite delicious and surprisingly (for me at least) addictive. Design buffs will also like that they come packaged in lovely bright green and purple boxes. S and I also had the pleasure recently of tasting some delicious traditional Malay cakes (“kueh”) from a small micro-bakery called Zaiton’s. Zaiton’s sells pineapple rolled tarts, makmub, sugi and kek kukus (a fruit cake). The pineapple tarts were especially good. S was delighted at the butteriness of the pastry, declaring that these were the best she’s had in years. To order or for more info, please email zaiton_cater@yahoo.com.sg. I’m told that in addition to these lovely cakes, they also offer packet lunches and dinners. The best thing is that they deliver right to your doorstep. From tomorrow onwards, S and I will be posting from Bangkok, where we will be attending the Four Seasons Hotel Bangkok’s World Gourmet Festival. Visit often to catch our coverage of the events and interviews with some of the world’s best chefs. They sound indeed very rich – but really pretty with those Chinese signs! Hope you both will have a great time and I can wait to read your write up! oh pluck is finally open! will check it out soon. Anonymous: Hey, good catch. I’ve just changed it. Thanks. hey, great reviews and beautiful photos on your site! they never fail to make me drool. btw, that’s an awesome tshirt in the basil alcove pasta photo. where did your model get it?